A person I imagine is a Musical Assumptions reader sent me a link to this 2004 New York Times article by Bernard Holland that I found to be great food for thought. I won't duplicate my reply, but I will use this moment as an excuse for a ramble. Holland touches (without articulating it as such) on the difference between ways of knowing that are best demonstrated by looking at the German "to know" verbs Kennen and Wissen. Wissen could be applied to "stuff you know about," while Kennen is used to talk about things you know personally, like people. I'm not sure if I could use Kennen to talk about a composer who I have never met, but I suppose could use it to talk about his or her music. Anyway, my ramble concerns the what Holland muses on concerning the difference between appreciation and understanding when it comes to music. I consider the road between appreciating and understanding music, particularly of the "classical" kind, to be long, winding, dangerous, and always under construction. As a matter of fact, once I think I understand something, I am often proven wrong. When I was growing up my father used to abbreviate his saying, "I don't pretend to understand these things," as the word "IDPTUTT." I totally forgot about that "saying" until ten minutes ago. He used it to try to explain (or explain away) the interpersonal workings of musicians and administration in his orchestra. I use it to try to explain what it is I know about music itself. Which, I can proudly way is more slanted towards the "easy" slide of the teeter-totter, and we can call "appreciation." The more I mess with music as a practicing and performing musician, the more I am able to observe patterns, tendencies, mannerisms, idiosyncrasies, and "personality" in the music I play, but the more I write, the less I am able to see those things in my own music. The closer a person is to me, the less I seem to know about the way that person thinks and acts. Perhaps that is the reason we develop close relationships: the element of surprise and delight that they can bring. I have close friends who have absolute feelings about the teachings of their religion(s). These are really good people who "walk the walk" in addition to "talking the talk," and appear to be certain that their understanding of the universe, life, and their concept of an afterlife is correct. (Some of my favorite composers like Bach, Haydn, Mozart, Schubert, Beethoven, and Brahms fall into this category as well). My sense of "understanding" anything is constantly in flux, and I can't even imagine what it would feel like to be certain about anything. In a way I envy that singular mindset, but I always seem to pull away from it by trying to learn new things and new ways of looking at and listening to everything. Perhaps we return most to those things that we can't understand, because we experience them with our senses rather than with our minds. Food would be an example. Some people can conjure up flavor from out of the blue, but when they do it becomes a craving for the real thing. We may not "understand" why we want something, but we are sure happy when we get it. Our senses sing. It works the same way with music for me. We can know (as in the verb Wissen) what needs to go together to make a particular kind of food come together, but perhaps it is our senses that allow us to know (as in the verb Kennen that something needs a bit of salt. Or cumin. And with music it works the same way. You can supply your own examples. It's time for me to think about lunch. This episode of The Story includes a fascinating radio conversation from 1959 that Terkel had with Dorothy Parker where she describes the "beat poets" as not being very interesting and not really having anything "new" to say (it has all been said before). I love hearing Parker's diction next to Terkel's. It comes from a commercial recording called "Voices of Our Time" that is made of Terkel's recorded radio conversations with scads of people from the second part of the 20th century. Musicians include Copland, Cage, Bernstein, Segovia, Betty Carter, Mahalia Jackson, and Pete Seeger. There are three more episodes of "The Story" celebrating what would be Terkel's 100th birthday. 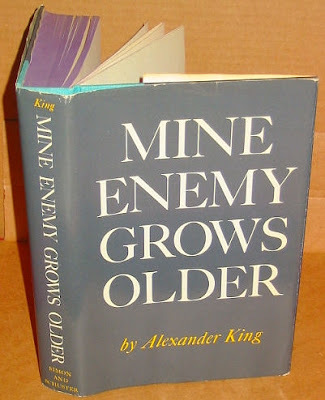 My friend Margie King Barab, who is married to Seymour Barab, was, as a young woman, married to Alexander King (she was his fourth and final wife). Margie is in the process of writing a memoir about her life with King, and after reading the draft of Margie's memoir, seeing Alexander King's paintings hanging on the walls of the apartment where she and Seymour live, and seeing video recordings of "Alex in Wonderland" (which belong only to Margie), I could see how as very young woman coming straight out of Nebraska, Margie might have been charmed by this brilliant man. After reading around 100 pages of Mine Enemy Grows Older, I can understand completely why she was smitten. The book, published by Simon and Schuster in 1958 (my copy is its sixth printing), comes with two dust covers. 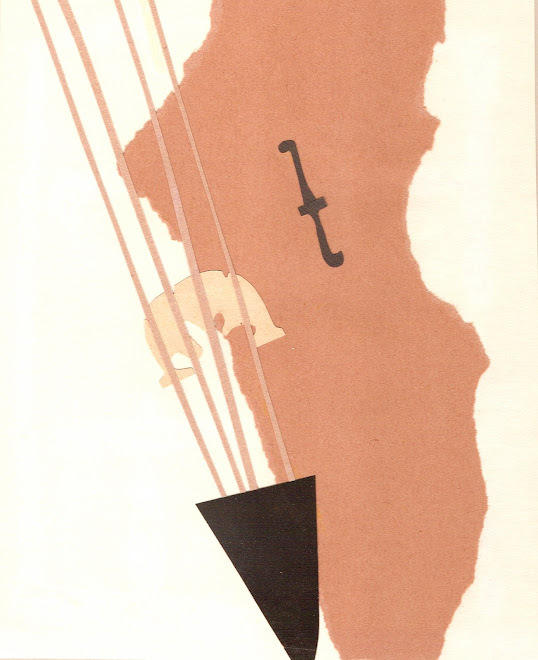 The one with the cello and the horse (how did Alex know that Margie would marry a cellist after he died?) is the outer cover, and the grey one is the inner cover. 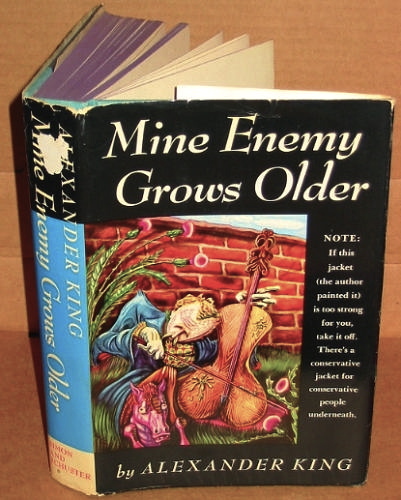 The text on the outer cover reads, "NOTE: If this jacket (the author painted it) is too strong for you, take it off. There's a conservative jacket for conservative people underneath." The reviewer I linked to above (on The Neglected Books Page) seems to think that the book becomes tiresome towards the end. I'll let you know when I get there. But for the time I remain thoroughly entertained. I'm not quoting anything because I taking the copyright warning seriously. I did not take the above photos: they came from an Amazon listing! If you can find a copy of this book in a used bookstore, grab it. Michael prefers to use a doorstop, but we always seem to have a cork or two rolling around the table (and they don't roll once you prop an iPad on 'em). They are light enough to keep in a pocket or purse. It sounds crazy, but two hours ago I was in terrible pain from a "little" steam accident involving vegetables, a microwave, some plastic wrap, and a serious dose of stupidity. 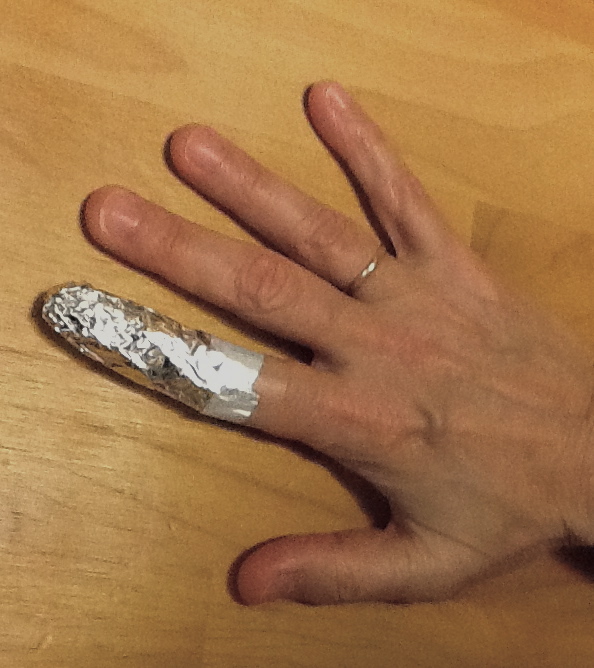 I wrapped my finger in aloe (we keep a plant on the window above the sink), but when it began to hurt so much that it made my stomach hurt, I took to the internet and found a discussion about using aluminum foil to treat burns. What? It sounds crazy, but it really does work. It may be because the foil keeps the burned skin away from the air, it may be because the foil makes the finger sweat, and sweat promotes healing, of it might have something to do with the foil itself. I will be keeping this thing on all night (no practicing for me), but I can tell you that it really doesn't hurt much at all right now. It was also therapeutic to read about the other stupid ways other people managed to burn their fingers. After 12 hours (a night of sleep) my finger feels normal. I'm typing with it. It looks a little worse for wear, but there is no blistering. This is really a miracle cure. Aluminium foil! Who woulda thunk! When I think about being "young," I group youth into a 25-year continuum of events that ended in an identifiable personality that I sometimes recognize in photographs (and sometimes don't). The kitchen device that most comes to mind is a French press coffee maker (a device that wasn't in common use until after I was 25, by the way). You put the grounds in, you add boiling water, and you press the spent grounds to the bottom, leaving their essence in a uniform beaker of coffee. 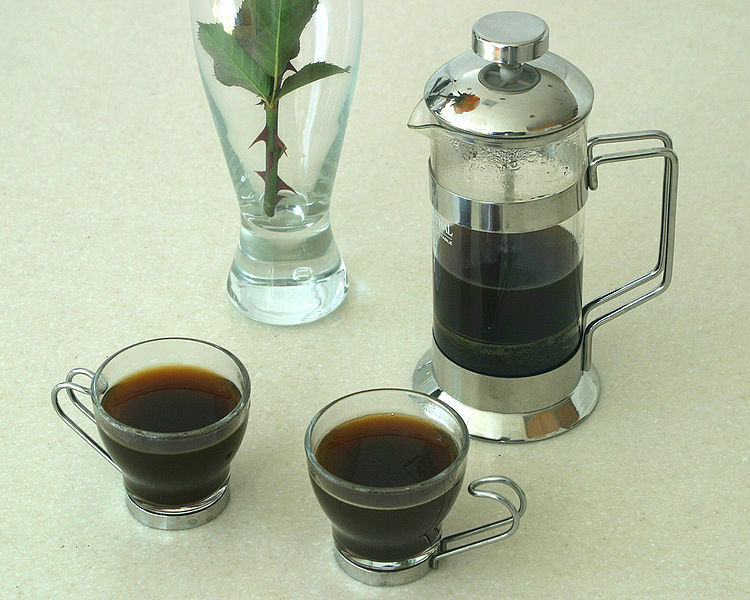 What you do with that coffee after it is pressed has a lot of variation: the choice of cup and portion size, the choice of sugar, milk, cream, soy milk, ice, ice cream, liquor, and the choice of when in the day you drink the stuff. The main point is that what went in becomes a uniform brew made from the quality of its blend of ingredients. 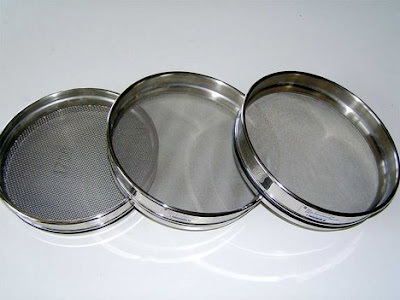 The next stage of life for me would be a sieve. Motherhood, by its very nature, gives us the gift of forgetting large chunks of the difficult times like the exhaustion and the stages of parenting that are challenging. We are happy to forget the lack of personal time, the isolation, and the knowledge that everything is changing constantly before our very eyes. There is, for a period of time, nothing to hold on to. My next stage would be that of a funnel. After our children no longer need every bit of our attention, personal substance starts to creep back into our lives. The process of liquid in and liquid out is slower, partially because there is more there. We don't want to spill the liquid because it is precious, but we have to be patient while it works. 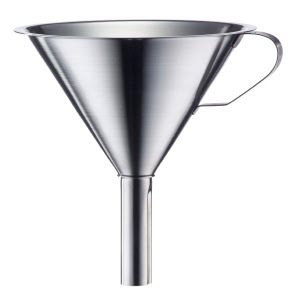 Funnel technology has been around for a long time, and funnels come in all sizes and can be used for many things. I have, as of last week, entered a new stage of life that I associate with a new kitchen device: the Vinturi Wine Aerator. This device is a combination of a sieve and a funnel, and is used for that great comfort of adulthood: a glass of wine. The device is a funnel that is constructed in such a way to draw air into wine as it is being poured. This brings out the flavor of the wine, the way pouring a glass and swishing it around for a while brings out the flavor, but it happens instantly, and it makes a nice sound while it works. We tried it in New Jersey, while visiting with our friends who always have great wine (and I mean GREAT wine), and then we bought two Vinturis: one for my father, and one for ourselves. Yes, the ideas still need their time to come together, but they are so much more interesting when they blend with the air from the here and now. And they also work best one glass at a time. Unfortunately one of the things I learned recently is that a computer can die suddenly. Mine died yesterday, right after lunch, and during an afternoon that I planned to fill with computer-based work. Anyway, while I was not doing what I planned to do, Michael wrote a terrific blog post about our recent trip to Boston and New York (and New Jersey) that I will share here.
. . . The only way to write a good short story, you said, was to write a good short story. Only after it is written can it be taken apart to see how it was done. 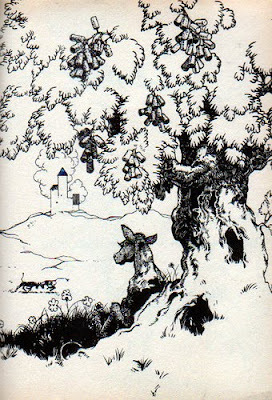 It is a most difficult form, you told us, and the proof lies in how very few great short stories there are in the world. The basic rule you gave us was simple and heartbreaking. A story to be effective had to convey something from writer to reader and the power of its offering was the measure of its excellence. Outside of that, you said, there were no rules. A story could be about anything and could use any means and technique at all—so long as it was effective. As a subhead to this rule, you maintained that it seemed to be necessary for the writer to know what he wanted to say, in short, what he was talking about. As an exercise we were to try reducing the meat of a story to one sentence, for only then could we know it well enough to enlarge it to three or six or ten thousand words. So there went the magic formula, the secret ingredient. With no more than that you set us on the desolate lonely path of the writer. And we must have turned in some abysmally bad stories. If I had expected to be discovered in a full bloom of excellence, the grades you gave my efforts quickly disillusioned me. And if I felt unjustly criticized, the judgments of editors for many years afterwards upheld your side, not mine. It seemed unfair. I could read a fine story and could even know how it was done, thanks to your training. Why could I not do it myself? Well, I couldn't, and maybe it's because no two stories dare be alike. Over the years I have written a great many stories and I still don't know how to go about it except to write it and take my chances. This excerpt from John Steinbeck's 1962 letter to Edith Mirrielees, his writing teacher at Stanford, could apply easily to the experience of writing music. I had the most inspiring music teacher when I was in elementary school. We parted ways after I finished sixth grade, because she married an Asian history scholar who built harpsichords, and left Massachusetts for Ohio. Pat and I were out of touch for a decade or so, but I happened to find her phone number in a listing in the 1985 Boston Early Music Festival catalog, and called her to let her know that I was moving to the midwest. It happened that she and her husband were just about to leave Ohio (perhaps even that week) and start a piano museum in the small town of Ashburnham, Massachusetts. If you live anywhere around the Boston area, I would seriously suggest planning a day trip to visit the Historical Piano Study Center. Hearing Beethoven (or playing Beethoven) on the same kind of piano Beethoven used, hearing Brahms (or playing Brahms) on the same kind of piano that Brahms used, and hearing (or playing) Debussy on the same kind of German (!) piano that Debussy used, changes everything. Click here to see a photo listing of the pianos in their collection as well as the ones waiting "in the wings" (ugh Flügel--I couldn't help it). Sean Mallone has a new blog called Contrapuntalism that I am certainly bookmarking and planning to visit often. This post has a very clever grid-type chart that helps clarify the various contrapuntal features of some often-used forms, particularly forms used in the baroque period. There's lots of stuff about pencils and music paper too. Why is it so and not otherwise? Coleridge is famous for saying, “Nothing can permanently please, which does not contain in itself the reason why it is so, and not otherwise.” That has been the cornerstone of my creative life since I found it in Malamud's The Tenants when I was a teenager. Writing music is often a case of serial (or non serial, in my case) problem solving, and there is usually one solution that appears to be better than all the others. When I look at music by Bach, particularly the Toccatas, I notice that he tends to exhaust all possibilities of "so and not otherwise" by spinning out each possibility systematically. His answer to the question of "so" and "not otherwise" is to make the "so" big enough to encompass the "otherwise," and he is able to do it in a way that remains interesting and engaging throughout. Most of us mortals are lucky to find a "winner" among the choices, and that "winner" sometimes displays the qualities necessary for it to live as a musical phrase, a chord progression, a choice of dynamic, or a kind of articulation. The choices we have when we play are far greater, and they are far more difficult to identify or duplicate. And when we duplicate something it usually comes out sounding "duplicated." Nobody wants that. It destroys the creative element in music making, and simply cannot "permanently please" if it is "canned." In playing the "why it is so, and not otherwise" has to come from a larger feeling, a sense of the moment, a great degree of concentration, and a whole bunch of experience. "Why it is so, and not otherwise" often becomes "because that's the way I play it," or, in the case of something worked out through practicing, "because that's the way the phrase needs to go." This post is actually a ramble. My original thought for it came from watching a group of people talking on one of the Book TV channels. I don't want to name names, but two were well-known writers, one was a relative of a well-known writer, and the other was a person from the world of acting known for reading (aloud) the works of one of the writers. Everyone in the panel was "of a certain age," and at the end they took questions from the audience. One woman stood up to ask a question. She mentioned (right away) that she had written a book, and she told the panel on stage that people told her that it wasn't a book because it was self-published. She mentioned that she carried it around with her alongside two self-published books written by one of the writers on the panel. Her question for the panel concerned the need to ask permission for validity, and ultimately she was asking how she, who admired the people on the stage, could maker her way to be valid they way they had validity. The answers from the people on the panel didn't really address the question. I thought about how I would answer her question, and my answer, which might have been informed by the Coleridge quote, wouldn't do her any good. What she really wanted was to have someone on the panel say, "Let me see your book, and I'll tell you if it it is a real book." Then she would be able to connect herself with the accomplished person on the panel, and use that connection to get to the "next level." She would have been happy if someone in the audience (and there were well-positioned people in the audience) would look at her work. She was asking, in a very public way, for validity, while asking at the same time why as a woman writer she felt the need to ask permission to be a writer at all. She brought up a question that could really make a good panel discussion in itself. Aside from a couple of serious acts of misogyny (which make me cringe and I will NOT duplicate here), Coleridge said some more clever and insightful things. I have always wanted to write film music, but I have never gotten the opportunity, so I decided to try my hand at writing music for this 1908 film by Segundo de Chomón. The score and parts are in the IMSLP. What a treat it is finally get a chance to see Graham perform this ballet! and here's an excerpt from the ballet with Hawkins and Cunningham that is mentioned in the comments!